It is a great feeling to see this book project come to fruition. In a way it is a natural and evolutionary progression from my perspective. That is, back in 1996, I founded the Athletic and Therapeutic Institute, or ATI, literally in my basement. Not unlike a proverbial “garage start-up”—my focus was not that of technology hardware or software development, but rather developing a unique approach to help injured workers regain their strength, their confidence and thus their jobs and their lives. This book provides an amalgam of perspectives—not all necessarily in accord with one another either. The editors, Chris Stout, Matt Kruger and Jeff Rogers, come to work with the injured employee population from differing perspectives themselves, in fact they wanted to be “professionally ecumenical” in the opinions and point of views they present, and as a reader, I am sure you will see that they accomplished this. As ATI has grown from my basement into a national company in five states as a provider of outpatient physical therapy and related services to injured patients and workers, we currently have over 100 clinics in Illinois, Wisconsin, Delaware, Maryland and Pennsylvania. Early on, ATI worked to distinguish itself by incorporating a comprehensive treatment philosophy in all types of care and clinical services that incorporate best practices from traditional physical therapy, exercise physiology and strength/athletic training, synthetic with relevant evidencebased findings from the scientific literature. In fact, while much of the unifying thread of this book is based on evidence-based practices, it was just that concept that our flagship and pioneering F.I.R.S.T.™, or Functional Integration of Rehabilitation and Strength Training program was born. (F.I.R.S.T.™ is a work conditioning/hardening treatment based program.) When I started F.I.R.S.T. ™ and ATI, I was driven by the necessity to develop a far more effective rehabilitative treatment option than standard rehabilitative programs. So, in developing the F.I.R.S.T. ™ model, I first sought “ecumenical” input from orthopedic surgeons, physical therapists, athletic trainers, exercise physiologists, attorneys, occupational medicine specialists, and bio-mechanists in architecting an optimal and unique return to work program. Over the past 10 years, the F.I.R.S.T. ™ program has successfully returned over 5,000 post-therapy patients back to work. A similar perspective of identifying problems, finding solutions, and considering differing perspectives is the formula that Chris, Matt, and Jeff have used while writing their book, and I applaud them for it—for I know another similarity is that it was not an easy nor a fast project to complete. And to their credit, I believe it is a success. This book is the result of a thoughtful request by the publishers at Bentham eBooks. Had it not been for their suggestion, this project would not have been started. While the editors of this book are quite active and always interested in publishing, a book was not something that had been considered before this suggestion from Bentham. As with all book projects, and especially with edited works, there are many important people involved. First and foremost, the editors would like to thank the publishers at Bentham for their generous invitation. 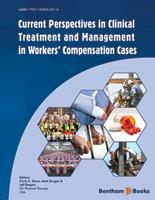 In formulating the structure of this book, the editors additionally developed a new questionnaire and posted it online for interested workers’ compensation professionals to frankly and anonymously weigh-in on the various aspects involved in working with the injured employees. Had it not been for those respondents, there would be no Part Two of this book or the fascinating insights provided by their answers. Next, the editors are thrilled to have some of the sharpest thinkers involved in the workers’ compensation arena who have generously contributed their time and talent in authoring their chapters. This powerhouse includes Robert Aurbach, JD, Martha Gely-Kruto, JD, Gregory Krohm, PhD, Richard W. Lenkov, JD, Gregory Moore, MPH, Joseph Paduda, Kim Presbrey, JD, Brian A. Pryor, PhD, Peter Rousmaniere, Dongchun Wang, Kathryn Mueller, MD, Dean Hashimoto, MD, Sharon Belton, PhD, Richard A. Victor, JD. PhD, and Maureen Kohl Bennington, MS. In the production process there are many of the proverbial moving parts—ensuring that the proper style is used, formatting, proofing, version control, and a myriad of other details that are all equally important in making this project a success. In recognition of that support, the editors would like to thank Hema Burra, Jillian Richardson, MA, and Marissa Webb, without their help, this work would still not be finished. Finally, the editors would like to recognize the injured worker. While there are many and often opposing perspectives involved in the workers’ compensation “industry”, it is important to keep in mind and recognize that the person in need is the one who is ultimately the focus of our concern, our trust and our responsibility. University of Illinois-Chicago 790 Remington Blvd.